Many fractures on the Moon are seen in the floors of ancient, flat-floored highlands craters. Such fracture networks often encircle all, or part of, the crater floor, and in some areas, show accumulated deposits of dark volcanic material. This Lunar Reconnaissance Orbiter Narrow Angle Camera (NAC) image (866 kilometers, or 538 miles across) shows a portion of one such fracture, located in the northeastern floor of Alphonsus crater. The fracture has been mantled by a dark, fine-grained pyroclastic deposit that appears to have moved down the wall of the fracture (at left) toward the floor (out of view to the upper right). The wall of the fracture is composed of light-colored rocks that are typical of the lunar highlands (mostly composed of anorthosite). Rocks and boulders of this bright material have also moved down the fracture wall; the largest one (near the top, center of the image) is about 8 meters across in its longest dimension. In some areas near the top of the fracture wall, dark boulders and mantling materials are seen. It is likely that this dark volcanic material came from a nearby volcanic vent located along this fracture network. 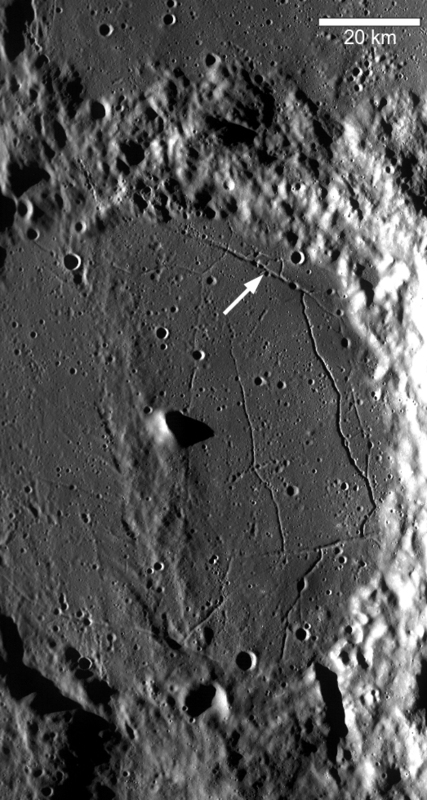 In Figure 1, LROC's Wide Angle Camera (WAC) M117507741, the arrow indicates the approximate position of the closeup. A NASA Constellation Site is centered just to the southeast of this view.